COX-2 = cyclo-oxygenase 2. A biochemical cell-signalling mechanism related to inflammation and pain. The researchers are focusing on endothelial dysfunction as neutrophils and other inflammatory cytokines have been linked to ischemia reperfusion (IR). By focusing on IR, the authors are studying the pain gateway theory albeit in a more cost-effective manner. In the paper, the authors discuss pain control theory. One can tell the researchers took time with the study as it follows the pain gate way theory. The first protocol demonstrates the benefits of EA by inhibiting COX-2 found in the spinal dorsal horn by decreasing inflammation and reducing neuropathic pain. The 2nd protocol demonstrates how NSAIDs may inhibit EA full potential. The authors are interested in the reduction of tissue damage post periods of ischemia, i.e. lack of oxygen. By definition, ischemia reperfusion may cause injury to the endothelial tissue after a time of no oxygen. The researchers made medical assumptions in an effort to study EA in a cost effective and more independent review board (IRB) approved manner due to working with humans. The inflammatory markers for pain are similar to the inflammatory markers in ischemic tissue. The authors used the healthy volunteers to study blood vessel response after being constricted via a pressure cuff, no blood flow, no oxygen. Reducing the pressure, the researchers used an ultrasound machine to see the difference of rebound in the vessel with EA vs. sham EA. So, technically, with medical terminology and the pressure cuff, there is no blood flow nor oxygen to the artery. The study is looking at how to slow or decrease the problem of tissue damage, particularly tissue damage due to lack of tissue oxygenation. The researchers hypothesize that the electro-acupuncture would be beneficial due to the pain gateway theory in COX-2 dependent mechanism. As it is the first study on humans using this theory, this is a Pilot Study. It also suggests that NSAIDs and other pharmaceutical medication may inhibit the full benefits of electro-acupuncture. Therefore, acupuncture and the treatment will be more effective when the patient is not on medication. 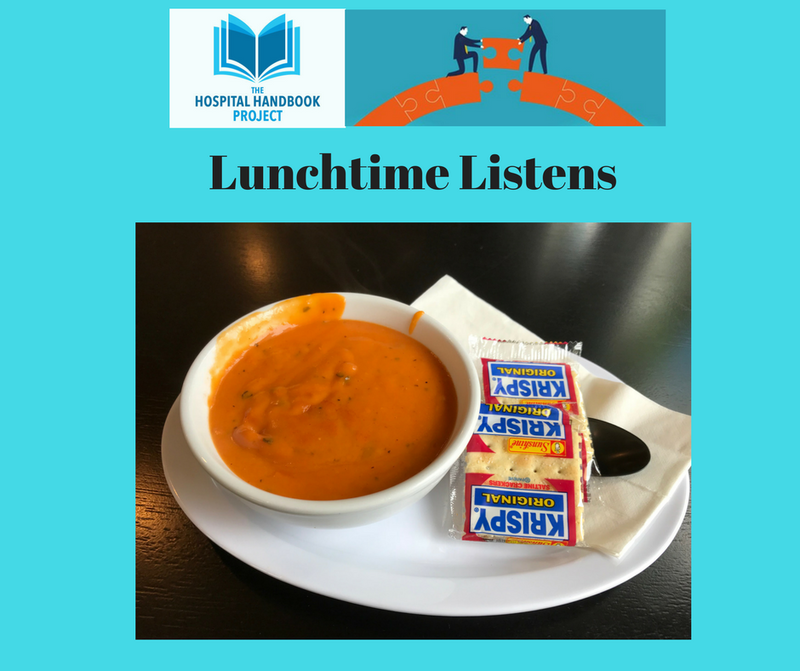 our guest blog post author today, Liz D! Hi, my name is Liz D. BS, MSAOM, EAMP, LMP. After 15 years in the healing arts, I am currently in the final stretches of earning my DAOM at Bastyr University along with participating in clinical rounds at Harborview Medical Center. The article is a pilot randomized crossover trial. The hypothesis involves the response and mechanism of electro-acupuncture (EA) in ischemia-reperfusion (IR) induced endothelial dysfunction in humans compared to the effect and mechanism of COX 2-dependent medication. The 2-part study involved twenty "healthy volunteers" in either EA or sham EA followed by 7 of twenty non-randomized/non-blinded volunteers taking a 15-day wash out from acupuncture then ingesting COX-2 inhibitor, celecoxib 200mg 2x/day for 5 days. The original inclusion factors involved non-smoking and between the ages of twenty-five to forty years old. The researchers excluded volunteers who had hypertension, diabetes, hepatic renal, thyroid, cerebrovascular disease, pregnancy, BMI greater than 25 kg/m and later excluded volunteers taking supplements or enrolled in another clinical trial. The volunteers in the first protocol were blinded via computerized random allocation sequence with permutable block design. Protocol 1 involved unilateral EA treatment at P5, P6, ST 36, ST37 (0.25mm x 40mm) low frequency ES-160, ITO at 1 cm depth at anterior forearm and 2 cm depth at anterior leg. The practitioner rotated the filiform a few times before achieving "de qi" then connecting to ITO at 2 Hz continuous. The non-EA points were located 10-20 mm lateral to P5, P6, St 36, St 37 but not above the median line at a depth of 0.5 cm and did not achieve de qi. The ES machine made similar sounds to ITO but did not stimulate frequency. Ischemia-reperfusion (IR) and flow-mediated dilation (FMD) were used as measurement. The volunteers rested 10 minutes in supine position prior to protocol. IR and FMD were measured after receiving EA or sham EA. In the sham EA as well as the active EA group, BA diameter and blood flow values were not different from baseline value before and after IR. Instead, sham EA had a decrease in FMD after IR. EA prevented the impairment in endothelium-dependent vasodilation induced by IR injury. FMD was significantly shortened after IR, showing COX-2-inhibitor prevented EA induced endothelial protection against IR. This is the first human study showing the response of EA on "endothelial pharmacological preconditioning" and further theorizes the mediation of COX-2-dependent mechanism. PLOS ONE is a peer-reviewed non-profit 501c3 journal. It has over 6000 academic experts on editorial board. Limitations to the study involve small sample size, single center and the volunteers were considerably healthy. Got 7 minutes? Speed Pharmacology's YouTube video on how NSAIDs work with audiovisual and cartoons, the first 7 minutes. "Pharmacology--NSAIDs & Prostaglandin Analogs (made easy)". Topics include: role of COX-1 and COX-2, mechanisms of action, therapeutic uses and side effects of NSAIDs, aspirin, non-selective COX inhibitors, naproxen, ibuprofren; selective COX-2 inhibitors including celecoxib. For a more thorough audiovisual review, check out Dr. Matt & Dr. Mike's Medical YouTube presentation. 24 minutes. Reviews the inflammatory process, prostaglandins, leukotrienes, NSAIDs and steroids, COX-1, COX-2, and acetaminophen. Corticosteroids: cortisol, cortisone, gluco-corticoids. Australian, so some minor drug name variations. Looking for more Research-Writing and Presentation Resources? "The Mind of a Leader" by Rasmus Hougard. This limited-availability video is an intriguing lead magnet from the Mindful Leadership Summit. "The Mind of a Leader" keynote presentation reviews, in 52 minutes, the findings published in The Potential Project's new book, The Mind of the Leader: How to Lead Yourself, Your People, and Your Organization for Extraordinary Results by Rasmus Hougaard and Jacqueline Carter. This video is available to view until Thursday, March 29th, 2018. View today's featured presentation video on the Mindful.org webpage. The Potential Project did a 2-year research project, working with the Harvard Business Review, about leadership. The results are published in the book, Mind of the Leader, which was released in March 2018. "Selflessness helps us to see the inter-connected-ness of organizations and make us understand our modest contribution. The only sound response is humility and gratitude." When you develop humility, it is easier to practice gratitude. Research has shown that "gratitude is [the most] empowering leadership skill." minute 43: compassion is also about giving tough feedback so [your employee/colleague] can grow and improve. Compassion is valuable leadership skill. Do you know how to develop your compassion? minute 44-48 short 3-minute "practice of compassion"
be aware of your intention throughout your day. Intention is directly related to acts of compassion. When leaders are (1) mindful, (2) selfless, and (3) compassionate, this creates trust and social cohesion. So, when hard times arise, the organization will be ready and resilient. More about Mindfulness: Are You Appreciating the Present Moment? If so, please support this community resource through the website today and watch these resources grow by following the blog and Facebook page. When our politicians learn more about the integrative health and wellness movement as part of mainstream U.S. healthcare from recognized experts, they can make better informed decisions when voting on health-care related legislation. Invite your U.S. House Representative to the March 15th, 2018, D.C. luncheon, Congressional Integrative Health and Wellness Caucus to learn more about Integrative Health during lunch. Call or Email to your U.S. House (federal) representative, with a link to this invite. Not sure who your U.S. House representative is? Use this look-up tool. Share a brief personal reason why this issue is important to you (constituent/voter). "Hello, I am ___(name)__ and my zip code is ___. As your constituent, I urge you to attend the Congressional Integrative Health and Wellness Caucus on Thursday, March 15th. This is an introductory educational briefing with lunch. Health care and access to integrative health as part of my health care team is important to me and my family. I hope you are able to attend this briefing or meet with one or several of the speakers." 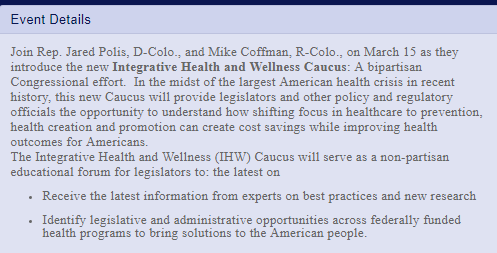 What is the Integrative Health and Wellness Caucus? 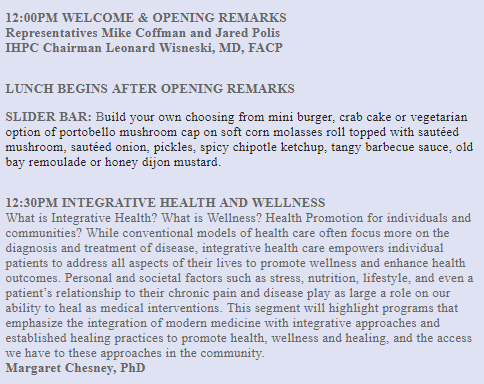 The Integrative Health and Wellness Caucus is a bipartisan Congressional effort. 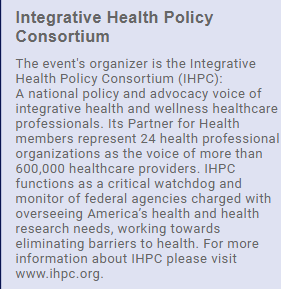 What is the Integrative Health Policy Consortium (IHPC)? 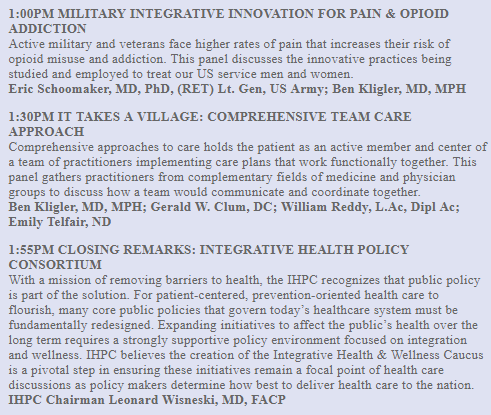 It is a national policy and advocacy voice of integrative health and wellness healthcare professionals. It represents 24 health professional organizations and 600,000+ healthcare providers. How did I get started on this work? Why am I passionate about making hospital-practice work available to East Asian Medicine Practitioners/Licensed Acupuncturists? Why do I want EAMPs/L.Ac.s to be available in hospitals and medical centers? Well, it's personal. And, personal stories are hard to share. So, while I recorded this video for our spring fundraiser at much prompting from colleagues and some family, I never wrote a blogpost to accompany this video. Until now. With the community growing the past several months and several major steps for hospital practice work being announced in the past 60 days, it seems like a good time. These major steps that have taken years of work from members of the profession and their advocates--the BLS occupational code (Jan. 1st, 2018), the Joint Commission Pain Standard (Jan 2018), and the VA Handbook Occupational/Staffing Code (Feb 2018). When I was in grad school, there was the troop surge in the Iraq war. And my brother was one of those soldiers. As I sat in class learning about Traditional Chinese medicine, I was thinking about how what I was learning could help my family and friends who were deployed. And, I learned that East Asian medicine is a non-drug non-surgery option for pain management. And, it decreases stress. And, it improves sleep. So, thereby, it helps increase resiliency. As it turns out, if you can improve sleep quality, decrease stress, and decrease pain you can decrease the probability of post-traumatic stress from becoming PTSD. East Asian medicine complements conventional medical care. So, how do we get East Asian medicine into the hospital system? How do we get East Asian medicine to those who need it? By working in the conventional medical system. By having Acupuncturists work in hospitals, medical centers, VAs, and military treatment facilities. There have been barriers to working in hospitals, the first of which is that we are new to the system. 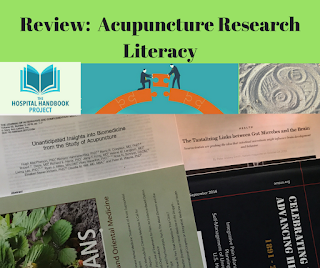 So, often, each time an Acupuncturist is hired into a system, they are the first or one of the first for that facility. So, the problem of reinventing the wheel is common. Instead of existing in silos, this Project endeavors to create connections community, and share wisdom. The hospital handbook project provides a ladder over the barrier and makes landing on the other side with your hospital sponsor a little softer. You still need to get up and get moving; and I believe your clinic and your program will be better poised for success because you have learned from the wisdom of others. This is what the Hospital Practice Handbook Project living resource aims to do. I wish these resources had been available to me when I started hospital practice. And I hope, by getting these resources published and collaborative projects funded, that this resource will be available to hospital practice acupuncturists and their sponsors. You can support this community resource by contributing $5 or $25 today and watch these resources grow by following the blog and Facebook page.